No longer a ‘one trick pony’, Vudu’s ambition to become a fully-fledged platform, capable of pulling in content from a range of third-party services, appears to be bearing fruit. Today the company announced that owners of its set-top box now have access to Internet radio service Pandora. 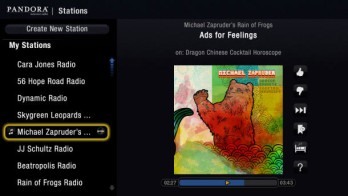 Features include support for multiple Pandora accounts, “enabling every member of the family to play his or her own personalized Pandora stations”, along with the ability to create custom stations and tweak them dynamically by thumbing tracks up or down. Pandora, along with existing support for YouTube, Flickr, Picasa and others, comes courtesy of Vudu’s Rich Internet Application (RIA) Platform, which aims to make it easy for third-party developers to add new functionality to the company’s range of set-top boxes. While not yet available to the wider developer community, Vudu has pledged to fully open up its RIA Platform later this year, a move that should spur access to all manner of free content. Dave Zatz, over at Zatz Not Funny, also reports on Vudu’s upcoming media extender functionality. Dubbed ‘Home Movies’, it looks like Vudu owners will soon be able to stream video content stored locally on their PCs, making the Vudu set-top box increasingly resemble the ‘open’ AppleTV I called for as long back as mid 2007!